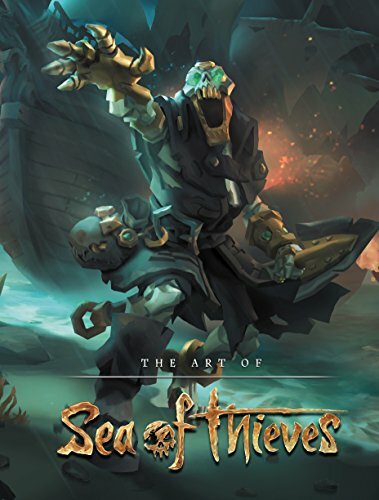 This is a wonderful video game art companion for Sea of Thieves. This book reminds me of The Art of Assassin's Creed IV: Black Flag. Both games focus on pirates but style of art is obviously very different. And that's what's so cool about art. When you give the same subject matter to different artists, you can get a totally different style and vibe going. This is a large 216-page hardcover packed with concept art for the character, environments, ships, props and weapons. There's plenty of character designs, sketches and in colour. Lots of variations to see. The costumes, and even tattoo designs. The character design is a mix of realism and caricature. It's somewhere is between so to me, the character don't stand out as much. All in all, these look like the typical everyday pirates, and I mean that as a good thing. The environment artworks are wonderful. Who doesn't like beautiful islands, beaches, coves, tropics, sunsets and the coconut trees swaying in the breeze. But of course there's a twist. This world is inhabited by pirates. There are many pirate ships. I love the detailed pirate ship designs. You can see the sail, mast, deck, hull and other parts, including interiors. There's a good mix of the ships drawn and rendered in 3D. Those ships really look beautiful and have so much character. The overall art direction is great. The designs look cohesive and belong to the same world.